I know I’m not alone in the misery of getting this less-than-perfect script to work during OSD and after a good couple of weeks of on-off testing I can finally say I got my desired result and it most certainly deserved a post. Please note, you may need to click on the pictures to see them fully. 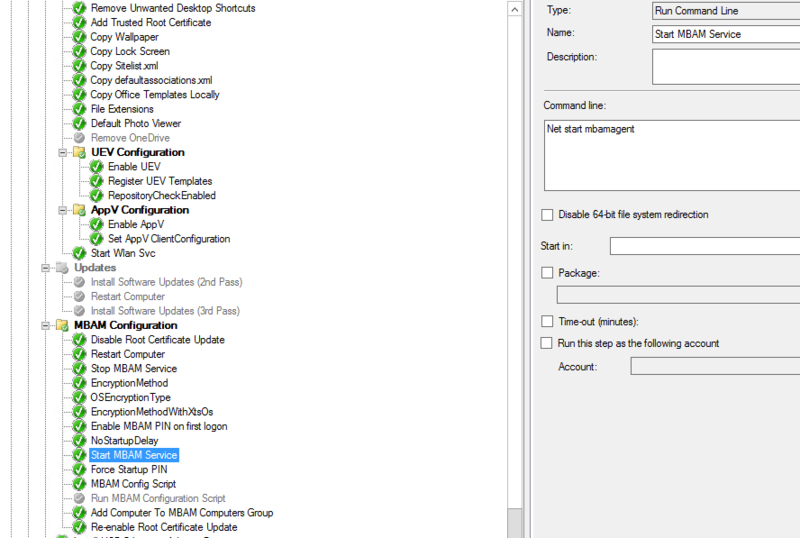 Encrypt used space only with XTSAES256 encryption and escrow keys in MBAM database during SCCM OSD task sequence. I also need a PIN to be requested automatically at first logon. I’m not going to detail the ins and outs of what I tried because this post will be far longer than necessary so I’ll concentrate on the steps that finally got it working for me. Don’t get me wrong, this is a buggy script that should really have been updated by Microsoft by now. Error code 1 is an extremely common problem and can result for any number of reasons. I would suggest you create an MBAM section in the task sequence, filtering on laptops or whatever criteria you require and add the steps below to this section. Contrary to what I have read elsewhere, the pre-provision step in the task sequence isn’t necessary. In fact, it’ inclusion will cause the error code 1. These steps should be disabled. 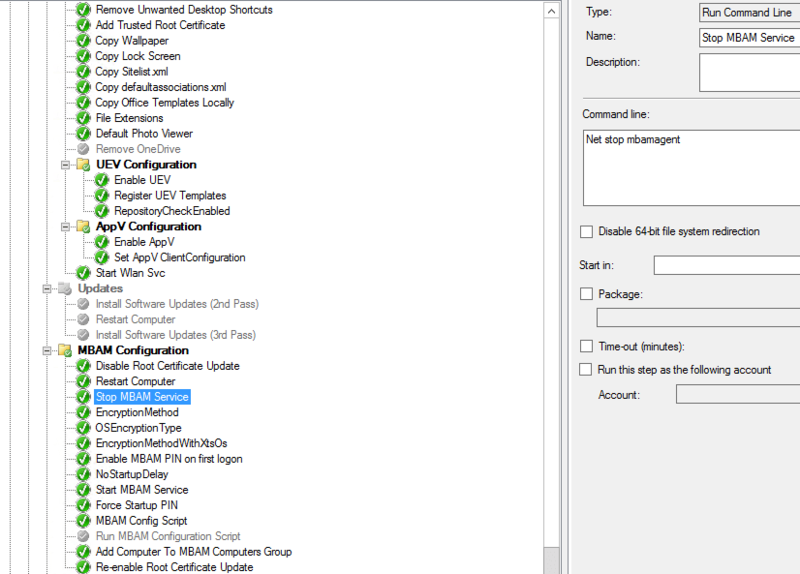 This is a strange one but I have had trouble getting the Invoke-MbamClientDeployment.ps1 to run properly without first disabling the certificate update mechanism in Windows. Trust me, just do it, reboot, run the rest of the steps and make sure you remember to re-enable afterwards. The assumption is that you have installed the MBAM 2.5 SP1 client with the August 2017 hotfix by this stage so there will be an MBAM Agent service running on the machine. Now I am recreating what worked for me here and despite my requirement for XTSAES256 the below setting seems to work fine for this in my task sequence. However evidence elsewhere suggests the DWORD value should be 7. Feel free to test in your own environment though and let me know how you get on. We want used space only as this is quickest. See here for other values. Be careful though – if you want the PIN prompt to appear at first logon the disk has to be ‘fully encrypted’, ie with used space only OR full disk. If the disk is still encrypting when the user logs on, they won’t be prompted for the PIN. This is where * I believe * stage 3 gets overwritten (tbc). Essentially this will set the OS encryption to XTSAES256. Call the MBAMClientUI on first login. Technically this shouldn't be needed as I have a step further down which will call this anyway but no harm in adding. Force MBAM client to wake up within a minute. This adds a setting to the default user so that every NEW user that logs onto the machine gets prompted for a new MBAM PIN for startup. Note, this will only fire if the disk is fully encrypted to type, ie used space only or full disk. Since we’re aiming for used space only here, disk encryption is pretty quick but it still needs to complete before the prompt will appear. If you log on before encryption is complete then the automatic prompt won’t appear and you will instead need to rely on GPO. 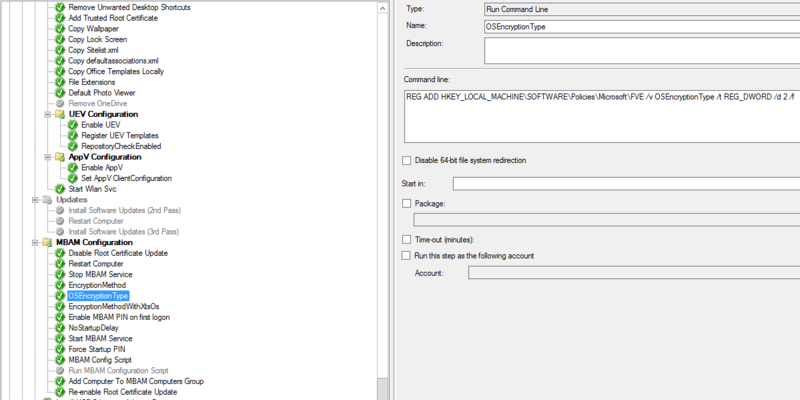 powershell.exe -ExecutionPolicy Bypass -command "reg load HKLM\DefaultUser C:\Users\Default\NTUSER.DAT; New-ItemProperty -Path 'HKLM:\Defaultuser\Software\Microsoft\Windows\CurrentVersion\RunOnce' -Name PromptForPIN -Value '""C:\Program Files\Microsoft\MDOP MBAM\MBAMClientUI.exe"""' -Type String; reg unload HKLM\DefaultUser"
The script itself. Note the encryption method, Unspecified. Because we have specified the encryption method earlier, the XTSAES256 encryption is automatically derived from that. Strangely, I couldn’t get this script to work unless I used this parameter and manually set the reg entry. Also note, I am running the script from the local installation of the MBAM client. This ensures that I am running the script that is aligned to that version of the client, ie it should contain any updates provided by any client upgrades you’ve applied, eg August 2017 update. Don’t forget to re-enable this otherwise you’ll end up with all sorts of certificate errors when trying to reach HTTPS sites. That’s it. One would assume much of this legwork should automatically be taken care of by the script itself but unfortunately that doesn’t appear to be the case. Don’t forget, you will also need to make sure that no MBAM policies are in place when the script runs. 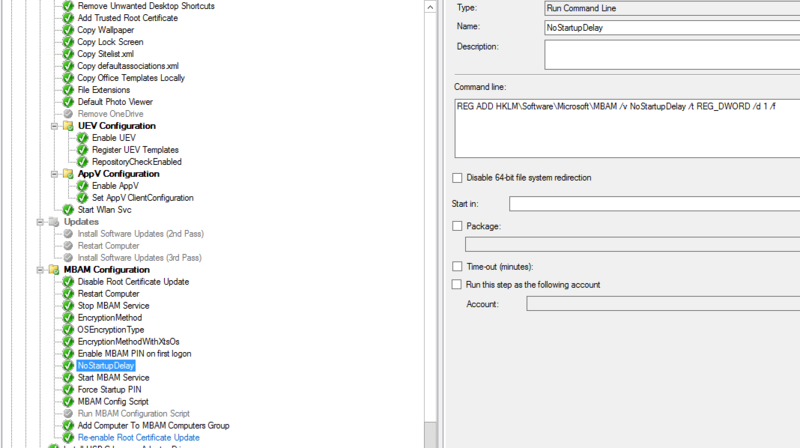 This isn’t a problem with SCCM as GPOs will be suppressed but if you’re using native MDT this can be an issue. Hopefully this will save some of you a few hours (more likely days) of frustration!